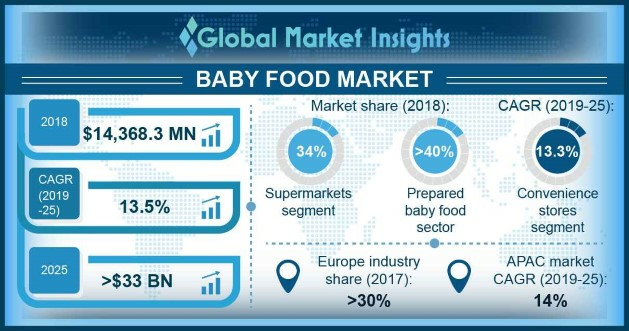 Baby Food Market size will exceed USD 33 billion by 2025; according to a new research report by Global Market Insights. Increasing infant population and corresponding rising food demand will propel baby food market size growth during the forecast period. According to world Bank, birth rates have remained highest in developing nations. Rapid urbanization, growth of middle class and increasing rates of female participation in labor force in many developing markets has encouraged adoption of convenience-oriented lifestyles, making prepared baby foods more wanted. The baby food industry is highly regulated, right from ingredients to its packaging and labelling. As the industry is increasingly globalized, the need for guidance, monitoring and regulation is growing. There are standards and guidelines for canned food for babies, processed cereal-based foods for babies, hygiene practice for children and infant foods and complimentary foods for infants and children. The standards set by each country may differ for baby food, for example, it may differ on ingredients in infant nutrition such as carbohydrates, fats, minerals, vitamins, etc. percentage of pesticide residue in food, etc. Also, every product needs to be pathogen free. Prepared food segment held the largest share of more than 40% in global baby food market in 2018. Prepared food is ready-to-serve and eat, hence has garnered attention globally. These are convenient for women who work outside their home, as it saves time. Frozen prepared food is increasingly becoming popular among parents and infants and the demand shall grow prominently during the forecast timespan. Convenience store distribution channels segment will grow moderately with a CAGR of 13.3% in global baby food market over the forecast period. These retail formats are prevalent in Asia Pacific and Latin America and consumers prefer buying baby food from here due to discounted rates. North America and Europe are prominent baby food markets. For instance, Europe accounted for more than 30% of the overall product demand amounting to USD 5.5 billion in 2018. Parents in these regions are more concerned about their infant’s nutrition and less about the cost. Thus, they are ready to pay for premium products which have necessary nutrients and minerals. Whereas in Latin America and Asia Pacific, price is an important buying consideration. Here, customers are less brand loyal and more inclined towards brands which provide essential nutrition at affordable prices. The baby food market is highly competitive, and many major multi-national companies are functional in this business such as Nestle, Reckitt Benckiser, Abbott, Danone, HiPP and Asahi. Other important players include Kewpie Corporation, Hero Group, Bubs Australia, DMK GmbH and Hain Celestial. The entry barriers in this industry are moderately high as it is a capital-intensive market and needs a backbone of strong research & development department. Competition in this business is stiff and numerous brands and store branded products at various price points compete for consumer attention. Established players such as Nestle, Danone and Mead Johnson Nutrition (now a part of Reckitt Benckiser) have years of experience and consumer loyalty in baby food market. These players have strong and wide supply chain network and have backward and forward integrated their businesses to some extent. For example, Nestle has food ingredients business as well, which caters to its baby food business. Companies merge and enter into joint ventures to make the product penetrate deep into local market.